As a Starwood loyalist I assumed I had already visited almost all of the group’s best properties, given the number of St. Regis properties I’ve stayed at. However, Cala Di Volpe is a hotel I heard about for the first time last year, and it’s generally regarded as one of the best Starwood properties in the world. As I did some research I quickly learned that Porto Cervo in July and August is possibly the most expensive place on earth. During the peak season of July and August, standard rooms at Cala Di Volpe go for over $2,000 per night… and the hotel sells out months in advance. So clearly there’s a market for people with unlimited funds, as Porto Cervo seems to be one of the world’s most popular hangouts for the uber wealthy. Cala Di Volpe is open for about five months per year, and it closes every year at the end of September. If you visit in September the rates are drastically lower than in July and August. It’s still not cheap by any stretch of the imagination, but I got a deal that was good enough that I wanted to give the hotel a try. We found a rate for four nights of 510EUR per night, with the fourth night free, so we’d be paying an average of ~380EUR per night. That’s still more than I’d generally like to pay for a hotel stay, but that was a half board rate, meaning that breakfast and either lunch or dinner were included. Lunch or dinner usually retails for 200EUR per person (you read that right) so a lunch for two alone would typically cost 400EUR per day. I heard it was the most spectacular buffet I’d see in my life, so I was intrigued. Anyway, this wasn’t a cheap vacation, but at the same time for a half board rate I thought we were getting a pretty good deal, especially compared to how much the same room would have cost a month earlier. This hotel has limited participating in SPG. This means you still earn full Starpoints for your stay, though redeeming here is very expensive. It’s a Category 7 property, though a free night here costs more than 35,000 Starpoints. Still, at least I was earning eight Starpoints per dollar spent (I ordinarily earn four as an SPG Platinum 75 night member, plus two through the current promotion, plus two for paying with the Marriott Bonvoy American Express Card), which I view as a further “return” of 20% on our stay. We took a taxi from Olbia Airport to Cala Di Volpe, which took about 30 minutes and cost 80EUR. I hugely regret not renting a car, as it would have been a much better way to get around and also to explore the island. There’s a taxi mafia in the area, so prices are fixed and high. Driving anywhere within town costs 35EUR, even if it’s a five minute ride. 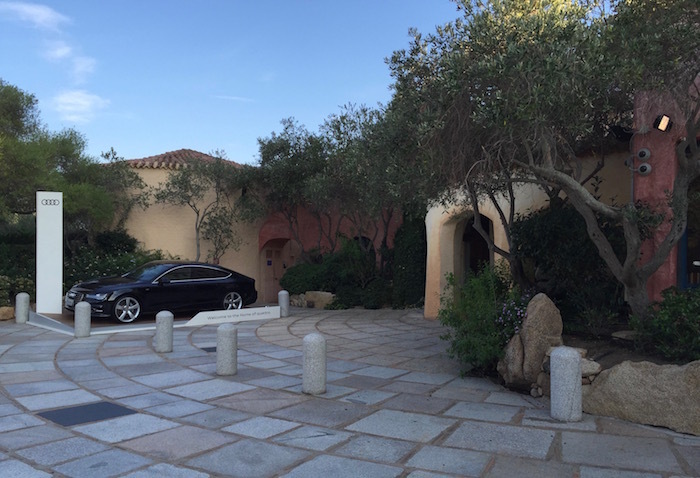 The exterior of Cala Di Volpe is understated, aside from the Audi car they have right outside the entrance, presumably as part of a sponsorship deal. Reception was located inside the lobby and to the left. While I was surprised there was no one to greet us as we pulled up to the hotel, the associate who checked us in was very friendly. We were arriving early, though he informed us that our room should be ready within an hour. We stored our bags and explored the hotel a bit. Anyway, the lobby is huge, and is a great place to pass time. There’s tons of seating, so you don’t need to be at the bar to enjoy sitting there. I spent a lot of time sitting in the lobby area working (if there’s one thing I’ve learned over time it’s that working from bed when traveling and jetlagged doesn’t end well!). Pretty quickly our room was ready, so we took the stairs up to the third floor. 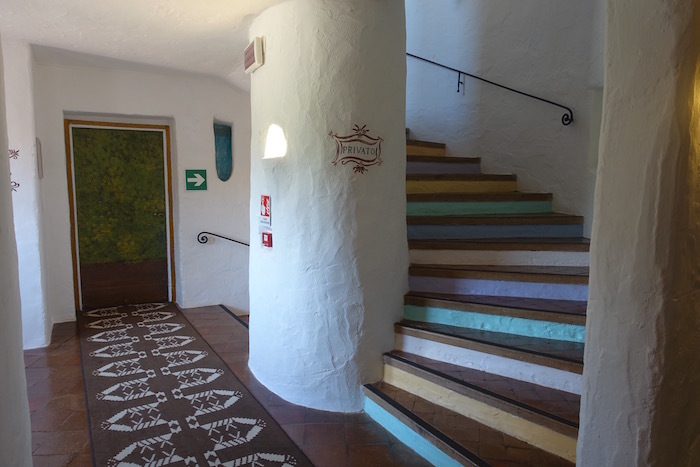 I loved the staircase, and how the steps had alternating colors. The hallway was equally gorgeous, as was the front-side exterior of the hotel (which you could see when arriving on the third floor before walking down the hallway). We were assigned room 265 (yes, it’s on the third floor), which was a premium room. The hotel only has a few room categories — specifically, there are classic rooms, premium rooms, and then a few specialty suites. We had booked a classic room, so the premium room was an upgrade. The room featured a long entryway, with the bathroom to the left and the rest of the room straight ahead. The room was a good size, with a comfortable king size bed, a sitting area with two chairs, and then a small desk. The mattress and bedding were excellent, and we slept really well throughout our time at the hotel. Opposite the bed was a flat screen TV, along with the sitting area and table. In the corner of the room opposite the bed was another chair, as well as a large closet, which had a pretty cool design. Back towards the entrance was the minibar, which we didn’t use (though they had a large complimentary bottle of water there that they replenished daily). The green-tiled bathroom was a good size, with double sinks, a walk-in shower, tub, toilet, and bidet. The shower had excellent water pressure and temperature control. Toiletries were provided by Acqua Di Parma. The highlight of the room, however, was the balcony. Initially I was a bit bummed about not having a real desk in the room given that I still needed to work as usual during the trip, but who needs a desk when you have a balcony with a view like this? I quickly realized that our room had one of the best views in the hotel. We were right in the center of the hotel, and the third floor is the last “full” floor of the hotel. We had a great view of both the pool, harbor, and resort. I spent hours a day on the balcony working on my laptop while enjoying the views. I can’t express enough how calming it was, as there was virtually no noise, and the temperature was perfect for most of our stay (low 70s). Shortly after arriving in our room we were brought a welcome amenity, consisting of fresh fruit and a bottle of prosecco, as well as a welcome note. With turndown service every night we were offered delicious Lindt chocolates. I’d also note that wifi in the room (and throughout the resort, for that matter) was top notch. I was expecting it might be slow given that it’s a resort, but I had no issues. Now let’s talk about the rest of the resort. Cala Di Volpe is very low key, so it’s not like they have a bunch of planned activities or a lot to do. Most people seemed to sleep in, then have a leisurely breakfast, then work or work out, then go to the pool, then have a leisurely lunch, then go to the beach, and then eventually have dinner. The setting of the hotel is just so gorgeous, so I’ll let the below pictures speak for themselves. The hotel has a large saltwater pool, which seemed to be a bit on the cool side, so people mainly relaxed outside the pool. The pool was also a great thing to pace around for the purpose of making loud phone calls. There were of course tons of lounge chairs, and while many guests used them, the area was never crowded. Past the pool area was a soccer field. Past that was an outdoor gym, which isn’t a concept I’ve seen in many other places. How awesome is that?! If the weather isn’t cooperating or if you prefer to be inside, there’s also an indoor gym one level below the lobby. The hotel has a gorgeous beach which can be accessed using their complimentary ferry, which leaves every 30 minutes throughout most of the day. Even if you don’t actually want to go to the beach, it’s worth it for the boat ride alone. The beach itself is nice, though not quite as exquisite as what you might find in the Maldives, for example. There are hotel employees there who will set up lounge chairs for you, etc. In the next installment I’ll cover dining at the hotel, which is perhaps the most over the top dining experience I’ve ever had, with the exception of afternoon tea at the Burj Al Arab. Perhaps that will shed some more light on what people do here all day, given that most people sit at breakfast and lunch for about two hours. I should also note that service throughout the hotel was great, in an Italian way. That’s to say that it wasn’t like Balinese or Fijian hospitality, but rather everyone was extremely professional, accommodating, and charming. I’ll talk more about it in the next installment, but clearly they’re used to catering to very demanding guests, so there’s just about nothing they’ll say no to. The resort itself is gorgeous, and so calming. I don’t remember the last time I’ve been as calm as at this resort, sitting on the balcony and just enjoying the views. The perfect weather didn’t hurt either. This is certainly a special place, and I see why it’s so popular. Is this place worth $2,000+ per night? Well, for us normal people, of course not. But for people where money is no object, I think the fact that they get away with $2,000+ per night rates and still sell out is all we need to know. Supply and demand, eh? Should You Redeem Your Starpoints At Ritz-Carlton Hotels? You have a pretty skewed concept of value from how most people live. 500 Euros a night in September isn’t all that cheap, and those buffet prices are insane. It also seems kind of sad to travel to a nice destination and eat the hotel most of the time. That being said, this is a helpful review and confirms I’m not missing much of anything. I love Italy, and I’m glad you enjoyed your trip. Maybe your most appropriate quote is that the pictures don’t do the resort justice. The lobby looks worn, and that room looks just old enough to be dumpy without being charming. The views are beautiful, but there are 100 coastal hotels in Croatia with views just as stunning, and at 1\4 the price. Very very interesting review. I insisted on the Platinum Suite Upgrade and got a stunning suite from the second day. I found Service to be average for these sky-high prices, compared to the Ritz Carlton or Mandarin. At least the front desk seemed to be arrogant and that’s a turn off for me when I spend my summer holiday there. Mehh, at least based on your review it really looks overhyped. I can see the charm and whimsy in the common spaces and the exterior, but the room and bathroom look like an 1980s beach house. The bathroom in particular looks terribly tacky. I don’t see why anyone with the kind of money needed to stay here in high season would tolerate those rooms. That’s where they filmed James Bond’s, “The Spy Who Loved Me”. Thanks for the review, 40 years later! What Carlos said. It looks deserted and really dull. I also agree with the Croatia statement. Our coastal hotel in Dubrovnik (Rixos Libertas) was so much more interesting, though it looked like a cruise ship on the outside. Glad to know it is still a wonderful experience. Have stayed several times ( first when still part of the Aga Khan hotels and later after sold to CIGA)). Glad SPG maintaining the standards as it (along with other three Aga Khan hotels) were unique and quite luxurious. If you ever have a chance to stay in hotels part of the Aga Khan group or formerly part of the group they are always spectacular in terms of architecture and creature comforts (the hotel division is run by his brother who is very focused on making architectural statements). So pleased you enjoyed as I have in the past. @Gortondemond Why would anyone want to enrich the Aga Khan group? Just as I would not knowingly enrich the Sands group for very plain reasons. No way in hell would I be paying close to 400 Euros for this place… if the rooms were a bit better maybe.. but nope…the surroundings are not enough to make up for the crappy room IMO. 400-500 Euros is at the top end of what I would pay for a hotel, 1/2 board is great but no way would I pay 200 Euros a person for a buffet lunch. 100-150 with champagne is max what I would pay for a champagne brunch/lunch. Do they not have simpler ala carte options? Compare to the luxury hotels in Japan, how would you compare these hotels in Italy? Many of the luxury hotels in Japan are also very calm, offer fantastic service, and have stellar food. Seriously underwhelming for the price. Fantastic review, why you paid 380 euro a night for this bathroom, bedroom and flinstons hotel is beyond me. This makes me seriously doubt your objectivity in general. My sis went there for her 10th wedding anniversary. The property was nice, but not for the value my brother in law and she spent. She found the property to lack value for money and actually quite boring after the second day. In contrast, the Galleria in Milan was equally expensive, but a truly spectacular property. It would be awesome if you could review some of the lesser known ultra-luxury properties such as those run by the Taj Group or the Oberoi Group. I stay at hotels a lot (I don’t own an apartment) and I consistently find myself drawn to the Taj and Oberoi hotels and resorts whenever I have free time. @Samantha A. – The Oberoi hotels are fantastic (mind-blowing) but freaking expensive especially since there is no way to redeem points or even link to a loyalty account, which is contrary to this blog’s vision. Having said that, it didn’t prevent my wife and I from indulging ourselves at two of their properties: the Vanyavilas for seven nights followed by the Wildflower Hall for six nights with a private jet to transport us between the two properties provided by Oberoi! What a spectacular way to see the wildlife in India. Wow they must have seen you coming! That hotel looks like something out of the Flintstones mate. Well done for talking it up but good grief what a disappointment. Don’t let Ford choose in future! If you even remotely like this hotel, I’d suggest Hacienda Vista Hermosa in Tequesquitengo, Mexico, about 20 minutes outside of Cuernavaca. Rooms only run about $70USD-$100USD/night. It was built around 1530 (not a typo) by Hernán Cortés, the Spanish explorer. Quite an amazing place, but it’s the real deal. 5-star, it is not, BUT the history of the place can’t be ignored. Modern life disappears when you get there. When I was there, it was spotlessly clean and the rooms were serviceable. I should note that not all of the rooms have aircon. Our room was one which lacked AC, but with the large fans I didn’t mind it, surprisingly. BUT beware if you’re booking in one of the rare warm months. Agree with previous comments, Dalmatian coast is equally stunning as Italian coast and not nearly as expensive at this moment (though the price is rising each year). Which may explain why Italians account one of the largest source of tourism in Croatia. Exactly ten years ago I spent five nights there with my wife during our Italy honey moon trip. Looking at the pictures absolutely nothing has changed since then. The room, décor, art work everything is exactly how I recall it. We both felt at the time that the resort was not worth it. It was only 20k points or rather 80k for five nights at the time.